The Care Planning & Assessment Review contains study guides for each of the Focused Clinical Exams and a bonus section for items pertaining to the Clinical Performance Exam that you may find helpful in your study and preparation. 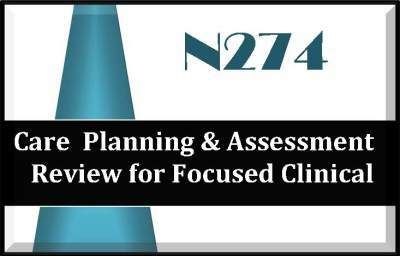 274A Head to toe assessment -The exam covers principles related to patient data such as health history, physical assessment, data interpretation, decision making and developing a nursing care plan. There is also a bonus Assessment Audio Review included. 274C Managing multiple patients -The exam covers principles related to quality & patient safety, managing a team, and collaborating & working with an interprofessional team. This section contains information on the clinical exam with blank forms, guidelines, tips and ideas on how to practice for the exam, and student submissions and journals. Both Study Guides are included in one (1) PDF document. The study guide portions of the document are noted in the table of contents; 274A study guide is 111 pages, 274C study guide is 56 pages. The study guides loosely follow the content guide outline / syllabus and covers all areas noted. There are over 1000 NCLEX style practice questions with rationales included as well as reviews, summaries, charts/graphs/pictures and/or flashcards to help with your study! The Assessment Audio Review is a companion item to your N274A Head to Toe study guide and includes a review of key concepts and principles related to physical assessment in MP3 format. It is a 'review', it is not a rendition of the study guide.